It turns out that maybe Gardner didn’t really mean all that stuff about being warm and fuzzy and moderate. Sure, he did what he needed to do during the campaign — voting against a bill, sponsored by Tennessee congresswoman Marsha Blackburn, that would have blocked deportation relief for those who came to the U.S. as youth. But today, Gardner lined up with Tea Party conservatives to support Florida Rep. Ted Yoho’s bill to prevent President Obama from carrying out his executive order granting deportation reprieves to unauthorized immigrants with family ties and expanding the program that allows migrants brought to the country as youth to remain in the U.S.
Gardner, who defeated Democratic Sen. Mark Udall and is positioning himself as a moderate within the GOP Senate caucus, voted with a majority of House Republicans in support of Rep. Ted Yoho’s bill that seeks to bar the executive branch from delaying deportations. Coffman, who pummeled Democratic challenger Andrew Romanoff in a re-drawn and newly diverse 6th Congressional District largely on the strength of his outreach to Latinos and other immigrant communities, was one of just seven House Republicans to vote against Yoho’s bill. “I voted against H.R. 5759 because, although I strongly believe that it is unconstitutional to have immigration policy made through executive orders and without the consent of Congress, this legislation will only mislead the American people into believing that we are taking care of the problem when the only way to address President Obama’s overreach is either through the U.S. Supreme Court or through the appropriation’s process,” Coffman said. Reps. Cory Gardner and Mike Coffman. After two years of failing to take up any attempt at meaningful immigration reform in the House, now Republicans have announced that in response to President Obama’s executive action on immigration, they’ll be voting tomorrow to undo the action. While the vote is largely symbolic as it would not pass in the US Senate, it’s a gesture that Republicans see as a way to express their anger at the President for taking steps within his authority to fix the immigration system on his own. We haven't heard anything from either Gardner or Coffman on how they intend to vote today, but Gardner's previous statements about President Obama's executive order are not encouraging. Most debate over the legality of Obama's order is among conservatives, including 17 red states that filed suit yesterday–this despite persuasive arguments from legal experts that the executive order was not just legal, but in line with similar actions taken by Republican presidents. We'll update after today's vote. 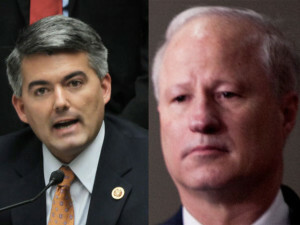 Did Gardner and Coffman's newfound support for immigrant rights survive November 4th? We're about to get our first indication. Let's wait and see. I personally think you're right, but if they do vote the right way I will thank either or both of them. So – "No", but not for reasons the Latino community will respect, nor that will please those who want real immigration reform. Bite me Cory. What a weasel. 6 years will seem like an eternity to have that weasel represent our State as a Senator. On the positive side next time he is up, it will be a Presidential year and the voter turnout will increase substantially. Gardner is running for Pres … that's the difference. V.P., not prez…. besides, the '16 prez nominee will be one of the GOP candidates from '12 or '08. It's traditional for the Republicans. That makes me feel better, Frank. Bush / Quayle redux ! !